Daily Attendance is a laborious job but its important. Archivist Attendance Management Software makes this process easy and helpful. While it is a necessary task, it can be quite tedious and time consuming to enter the attendance records of each student into your computer software manually. However, you can achieve the same results in a fraction of the time when you choose school attendance software such as Archivist online. Archivist online already considers all students currently enrolled at your college or school by default. All you have to do is add the amount of absences and late arrivals and the attendance management system will do the rest for you. Archivist online offers a number of different attendance management reports which can be used to provide you with all of the attendance records and reports on either a single student or an entire class; whichever you prefer. These reports generated by the Archivist Attendance Management Web Application provide you with an unlimited attendance history for each student so that you can quickly and easily access this important information as needed. There are 2 options to mark student device, either teacher or operate can use computer or every teacher can use his/her own smartphone to use Archivist Teacher module which allows teachers to mark their class attendance on their mobile phone. Its very fast and easy. By spending only a few minutes you can mark attendance of the whole school. 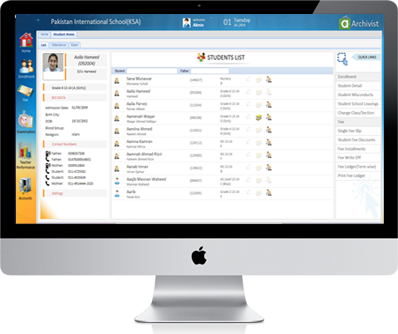 Attendance Management software keeps record of all the attendance to provide summary information on different occasions such as at the time of Result card printing. Checkout different analytical reports such as class wise attendance ratio, attendance register and more.